A mask is placed over the nose during sleep. Air pressure from the CPAP machine forces air through nasal passages and into the throat. This pressure holds the throat open and prevents both snoring and apnea events (periods of not breathing). CPAP consists of a blower unit, a mask, gear to hold the mask on, and a tube to connect the blower to the mask. The Mask: There are several ways to get air into the nose and upper airway: A mask that covers only the nose, nasal pillows that fit into the nostrils and on occasion a full face mask that covers the nose and the mouth. For most patients the nose mask is the most comfortable. Sizes vary from large to petite and from wide to narrow. Nasal pillows are more comfortable for some but may cause problems at higher pressures because the air blows directly into the nose. Nasal pillows also come in different sizes and must be turned correctly to fit the shape of the nostril. A number of different styles of masks area available, making proper fit for individuals likely. 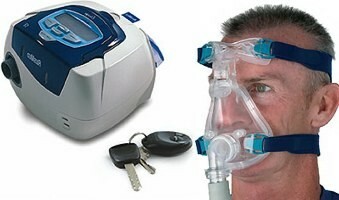 The CPAP Machine: Several different companies make CPAP machines. They all work on the principle that positive pressure holds the upper airway open. The Pressure: A pressure between 5.0 and 20.0 centimeters of water pressure (cwp) is usually effective. This is the amount of pressure necessary to hold up a column of water of that height. The higher the pressure, the more noticeable it is. However, patients at higher pressures also are able to use CPAP over the long run. Some machines gradually increase the pressure over several minutes at the beginning of the night; this feature is called a ramp. The ramp allows time to go to sleep before reaching the maximum CPAP pressure. When using CPAP, air will blow out of the mouth when it is open. This makes talking (or kissing) difficult when using CPAP. Some patients feel that it is difficult to breathe when using NCPAP. This sensation will diminish if one breathes calmly and deliberately. Watching TV and holding the mask up to the nose without strapping it on will help adjust to its use. Normally, a patient's mouth stays closed during sleep. However, in some cases, a chin strap may help hold the mouth closed. What should I expect if CPAP works? Patients should not snore when using CPAP. Because those on CPAP do not work as hard to breathe, have higher oxygen levels during sleep and have fewer awakenings, they also feel less sleepy and more energetic during the day. If a patient continues to snore or experience excessive daytime sleepiness, a call or visit to a Division of Sleep Medicine doctor is in order. The following statements are designed to test your knowledge of sleep and its function. Decide whether each statement is true or false and then read the explanations that follow. If you prefer, you can read all the questions and answers at once. 4. Opening the car window or turning the radio up will keep a drowsy driver awake. 5. Narcolepsy is a sleep disorder marked by "sleep attacks". 8. The body has a natural ability to adjust to different sleep schedules such as working different shifts or traveling through multiple time zones quickly. 10. More people doze off at the wheel of a car in the early morning or midafternoon than in the evening. 11. The average teenager needs about 8 hours of sleep every night. 12. You can make up for lost sleep by drinking caffeinated soft drinks or coffee. 13. Lack of sleep can affect performance in school, on the job, in sports, and can even make a difference in how you look. 14. Teenagers just naturally want to go to bed late and get up late. 15. Sleeping late on the weekends will make up for lost sleep during the week. 16. Driving while drowsy (struggling to stay awake) is a significant factor in traffic crashes. 17. Even a small amount of alcohol when someone is sleepy can make sleepiness worse. Although it is a time when your body rests and restores its energy levels, sleep is an active state that affects both your physical and mental well-being. Adequate restful sleep is critical to good health. Insufficient restful sleep can result in various mental and physical health problems. Many people doze off unintentionally during the day despite getting their usual night of sleep. This could be a sign of a sleep disorder. Approximately 40 million Americans suffer from sleep disorders, including obstructive sleep apnea, insomnia, narcolepsy, and restless legs syndrome. An untreated sleep disorder can reduce your daytime productivity, increase your risk of accidents, and put you at risk for illness and even early death. Persistent loud snoring at night and daytime sleepiness are the main symptoms of a common and serious sleep disorder, sleep apnea. Another symptom is frequent long pauses in breathing during sleep, followed by choking and gasping for breath. People with sleep apnea don't get enough restful sleep, and their daytime performance is often seriously affected. Sleep apnea may also lead to hypertension, heart disease, heart attack, and stroke. However, it can be treated, and the sleep apnea patient can live a normal life. Opening the car window or turning the radio up may arouse a driver briefly, but this won't keep that person alert behind the wheel. Even mild drowsiness is enough to reduce concentration and reaction time. The sleep-deprived driver may nod off for a couple of seconds at a time without even knowing it -- enough time to hurt themselves or someone else. It has been estimated that drowsy driving may account for an average of 56,000 reported accidents each year -- claiming over 1,500 lives. People with narcolepsy fall asleep uncontrollably -- at any time of the day, in all types of situations -- regardless of the amount or quality of sleep they've had the night before. Narcolepsy is characterized by these "sleep attacks," as well as by daytime sleepiness, episodes of muscle weakness or paralysis, and disrupted nighttime sleep. Although there is no known cure, medications and behavioral treatments can control symptoms, and people with narcolepsy can live normal lives. Insomnia has many different causes, including physical and mental conditions and stress. Insomnia is the perception that you don't get enough sleep because you can't fall asleep or stay asleep or get back to sleep once you've awakened during the night. It affects people of all ages, usually for just an occasional night or two, but sometimes for weeks, months, or even years. Because insomnia can become a chronic problem, it is important to get it diagnosed and treated if it persists for more than a month. Restless legs syndrome (RLS) is a medical condition distinguished by tingling sensations in the legs -- and sometimes the arms -- while sitting or lying still, especially at bedtime. The person with RLS needs to constantly stretch or move the legs to try to relieve these uncomfortable or painful symptoms. As a result, he or she has difficulty falling asleep or staying asleep and usually feels extremely sleepy and unable to function fully during the day. Good sleep habits and medication can help those with RLS. The human body's biological clock programs each person to feel sleepy during the nighttime hours and to be active during the daylight hours. So people who work the night shift and try to sleep during the day are constantly fighting their biological clocks. This puts them at a risk of error and accident at work and of disturbed sleep. The same is true for people who travel through multiple time zones quickly; they get "jet lag" because they cannot maintain a regular sleep-wake schedule. Sleeping during the day in a dark, quiet bedroom and getting exposure to sufficient bright light at the right time can help improve daytime alertness. As we get older, we don't need less sleep, but we often get less sleep. That's because our ability to sleep for long periods of time and to get into the deep restful stages of sleep decreases with age. Older people have more fragile sleep and are more easily disturbed by light, noise, and pain. They also may have medical conditions that contribute to sleep problems. Going to bed at the same time every night and getting up at the same time every morning, getting exposure to natural outdoor light during the day, and sleeping in a cool, dark, quiet place at night may help. Our bodies are programmed by our biological clock to experience two natural periods of sleepiness during the 24-hour day, regardless of the amount of sleep we've had in the previous 24-hours. The primary period is between about midnight and 7:00 a.m. A second period of less intense sleepiness is in the mid-afternoon, between about 1:00 and 3:00 p.m. This means that we are more at risk of falling asleep at the wheel at these times than in the evening -- especially if we haven't been getting enough sleep. Most teenagers need more sleep than their younger siblings and more than adults -- about 9 hours of sleep per night. While caffeinated drinks such as soft drinks and coffee may assist you in staying awake in the short run, they cannot help you make up lost sleep. Sleep deprived people can have difficulties in paying attention and concentrating. Lack of sleep can also affect your appearance. Research has shown that the biological clocks of teenagers push them toward later bed times and later rising times. You may not be able to catch up on lost sleep in only one or two nights. It usually takes several nights of refreshing sleep to return your body to normal. According to the National Highway Traffic Safety Administration, approximately 56,000 police-reported crashes per year result from drivers who were fatigued or asleep behind the wheel. When sleep-deprived, the effects of just one drink of alcohol can have the same effect as several drinks when fully rested. This Sleep Intelligence Test was created by the National Heart, Lung, and Blood Institute.